Golf appeals to a wide range of people from weekend enthusiasts and retired players to business people and competitors. It allows for relaxed conversation, but it can also provide competitive intensity whether played alone or with a group. 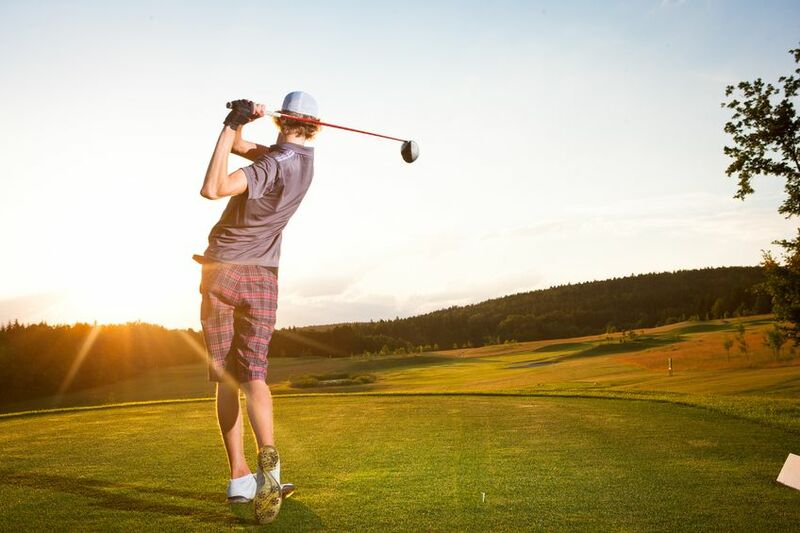 While it seems like a low-risk sport, golf injuries are common. Golf players must bend, twist and turn many body parts and can suffer from back, elbow, shoulder, hand, and wrist injuries. By improving technique and following a regimen of stretching and strengthening exercises, players can help prevent golf injuries. Strengthening exercises should be performed every other day in sets of 10 -15 repetitions. Over time they become easier without resistance, so adding resistance (weights, rubber tubing, medicine balls, etc.) should be used as you get used to the exercises. 2. Medicine Ball Chop: Hold a weight or medicine ball with two hands and stand with your feet staggered. Now bend your knees and twist at the waist while lowering the weight to the floor next to your lead foot. The heel of the rear foot should lift off of the ground as the weight touches the ground. Stand up and begin to rotate at the waist to raise the weight above the shoulder that is on the same side as the rear foot. When the weight is raised to the highest point, the heel of the lead foot should be elevated from the floor. This should be repeated with the legs staggered in the opposite direction. 3. Plank: Lie prone (on your stomach) and push yourself up off of the floor. Support your body weight on your forearms, elbows and toes. No other body part should touch the floor during the exercise. If it is too hard to support your body weight this way, you may allow your knees to touch the floor. The position should be held for 5-30 seconds or longer. 4. Side Planks: Lie on one side. Push your body weight up off of the floor and support it with our forearm and elbow on the side that you are lying on. The side of your foot rests on the floor during the exercise routine. If this position is too difficult, keep the entire side of your leg below the knee on the floor during the exercise. Hold the position 5-30 seconds or longer. 5. Squat: Stand in front of a chair as if you are going to sit down. Your feet should be shoulder width apart. Begin to “sit” down slowly and barely touch your buttocks to the chair seat. Return to an erect/standing position. As you lower yourself downward, your chest and head should be held upward and you should “stick out” your buttocks, don’t allow your kneecaps to move too far forward or beyond your toes. Don’t use your hands to assist the motion in either direction unless it is too difficult to perform. Stretching exercises should be performed daily, and each exercise should be performed 2-3 x and held at a comfortable “stretch” for a minimum of 20 seconds. The stretch must be held for much longer if you have not exercised prior to performing the stretching routine. 1. Knees to chest: Lie on the floor and slowly pull one knee to your chest and hold it there for 20 -30 seconds. Repeat several times with both legs. 2. Trunk Rotations: Lie on your back with both knees bent and your feet are flat on the floor. Roll both knees to one side and keep your shoulders flat on the floor. To increase the intensity of the stretch, after rolling both knees to one side, continue to move the top knee towards the floor on the opposite side. Keep both shoulders flat on the floor and reach up and gently push the top knee to the floor with the opposite hand. 3. Standing arm swings: Stand and slowly rotate your arms in circles. Move forwards and backwards. If your shoulders hurt when you move your arms above shoulder level, find a position that does not hurt and rotate in that range of motion. 4. Hamstring stretch: Place your heel on an object that is approximately 3-6 inches high. Keep your knee straight and lean forward at the waist. Try to put your chest on your kneecap (you will most likely not be able to do so). Do not lean forward and attempt to put your forehead on your kneecap. 5. Dynamic Trunk Rotations: Stand and slowly rotate at the waist and swing your arms from side to side. Advance this stretch by moving your arms in a “fig. 8” motion and allowing your heels to leave the ground as your torso rotates to the opposite side.